The International Research Centre for Intangible Cultural Heritage in the Asia-Pacific Region (IRCI), established in Sakai City, Osaka Prefecture as one of UNESCO’s Category 2 Centres, has been conducting research and surveys on disaster prevention for intangible cultural heritage in the Asia-Pacific Region since fiscal 2016. The Department of Intangible Cultural Heritage of Tokyo National Research Institute for Cultural Properties has continuously cooperated with the IRCI in its research projects. Recently, Tomo ISHIMURA, Head of the Audio-Visual Documentation Section of the Department, who also serves as Cooperative Researcher at the IRCI, joined the IRCI’s field survey in the Philippines. The Philippines is a country prone to natural disasters. For example, the volcanic eruption of Mount Pinatubo in the island of Luzon in 1991 caused catastrophic damage to Aeta, an indigenous tribe living in the area. More recently, in October 2013, an earthquake occurred near Bohol Island and damaged some historical buildings, including Santo Niño Church, the country’s oldest church in Cebu Island. The earthquake was followed by Typhoon Yolanda in November of the same year, which devastated many parts of the country, including the island of Leyte. Therefore, how to protect both tangible and intangible cultural heritage from such disasters is a major challenge. A field survey was conducted from January 24 to February 1, 2018, in the provinces of Ifugao and Abra, which are part of the Cordillera region in northern Luzon. Cordillera is a mountainous area where many indigenous peoples live, and therefore is home to a great diversity of intangible cultural heritage. Furthermore, many parts of this region are still underdeveloped and vulnerable to disaster risks. The project team for this survey comprised five members: Ms. Yoko NOJIMA, Associate Fellow of the IRCI; Prof. Norma RESPICIO of the University of the Philippines, specializing in textile weaving and dyeing; two officials from the National Commission for Culture and the Arts, Philippines; and Mr. ISHIMURA from the Institute. Of the two provinces, Ifugao is more famous because of the Rice Terraces of the Philippine Cordilleras listed by UNESCO as a World Heritage site. However, this heritage site was once included on the List of World Heritage in Danger because of the declining population and abandonment of rice farming by communities. Since then, community-led activities have been conducted to revive the culture. Hudhud Chants of the Ifugao was recently inscribed on the UNESCO’s List of Intangible Cultural Heritage, along with the traditional tugging ritual practiced in the village of Hapao, Ifugao, as part of tugging rituals and games jointly nominated by Vietnam, Cambodia, Republic of Korea, and the Philippines. 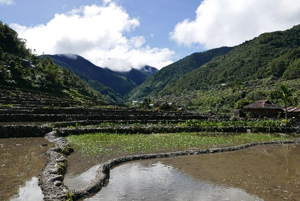 The survey revealed that because Ifugao is primarily located on rugged, mountainous terrain, landslides triggered by typhoons and earthquakes are serious problems for the province, often causing hazardous situations to rice terraces, houses, and roads. 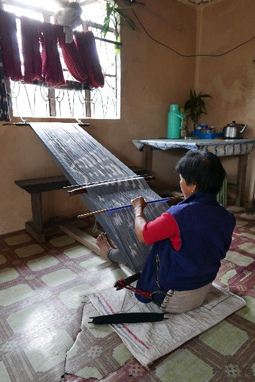 In recent years, however, local communities have been actively leading tourism and development programs, and the team witnessed how traditional handcrafts, such as textile weaving and wood carving, are gaining popularity. Thus, the province of Ifugao seemed to be successfully incorporating traditional culture with a modern approach by effectively taking advantage of the “brand” of the province, including UNESCO’s World Heritage or Intangible Cultural Heritage sites. Compared with other provinces in the Cordillera region, Abra Province is located in relatively low land, mainly over a basin along a river. From the survey, however, the team learned that deforestation and mining development in mountainous areas have exposed the province to the risks of such disasters as overflowing of rivers and floods. In response to this problem, the province has implemented the Lapat system, which incorporates a traditional resource use management system practiced by indigenous communities into the modern legal system. The project team examined how the Lapat system is helping the province achieve sustainable development. In addition, the remnants of traditional culture are still clearly visible in this province. It seemed that traditional practices, such as worshipping of a sacred stone called pinaing, or a ritual performed by a psychic medium called baglan, coexist with Christian beliefs and the knowledge of modern science to support the local identity. Through this field survey, the team learned how the two provinces are taking advantage of traditional culture in line with sustainable development and successfully demonstrating resilience despite their vulnerability to disasters. These examples would provide important suggestions for disaster prevention for intangible cultural heritage worldwide.